A net phone called the iPhone has been launched by Linksys just weeks before analysts were expecting Apple to release a similarly-named device. The wireless iPhone allows users to make free or low-cost internet phone calls using the Skype service. It joins a growing market of phones which use wi-fi to make telephone calls instead of traditional mobile networks. There has been intense speculation about Apple entering the mobile market for the last few months. Wireless net telephones are growing in popularity because they offer a low-cost alternative to making mobile phone calls. The phones can connect to wi-fi networks - which are often free or low-cost to access - and access the net to make telephone calls, using Voice over Internet Protocol (Voip). Increasingly, mobile phone manufacturers and operators are incorporating Voip services into handsets. Apple has neither confirmed nor denied that it is working on a mobile phone but speculation has continued for months with many analysts predicting it will be unveiled in January in San Francisco. Jupiter Research analyst Michael Gartenberg said the speculation around the Apple product - which was expected to be called iPhone - showed there was "pent up demand for something from Apple". Many analysts predict that Apple will launch a device which combines the features of a mobile phone with its popular iPod. But there is uncertainty over whether the device will simply be a Voip handset or will also connect to mobile networks. Jupiter analyst Thomas Husson, told the BBC News website, that he did not expect any Apple phone, if one were launched, to have an immediate impact on the mobile market. "It's a very competitive market. It will take time for Apple to be disruptive." He said that any Apple phone would most likely be sold direct to consumers, rather than through a mobile operator. That would mean customers would have to pay a premium for the phone, as it would not then be subsidised. "Apple would need to offer a compelling phone experience," he said. 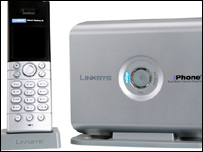 The Linksys iPhone comes in two models - a $180 (£92) model which can make Skype phone calls and a $200 (£102) model which is a dual Skype and landline phone.